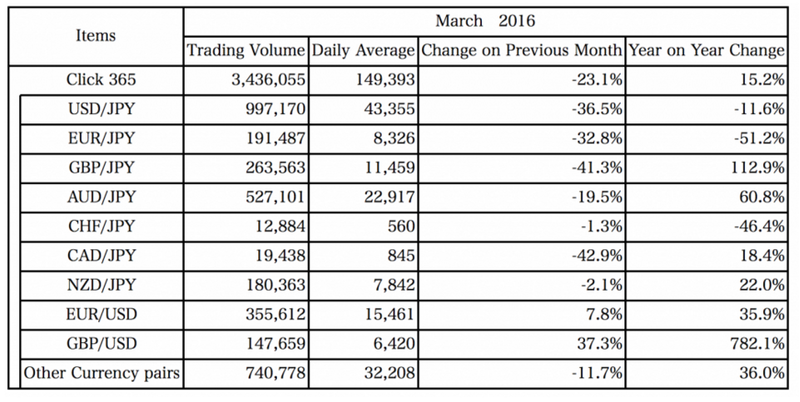 March 2016 Forex Industry Metrics: Volumes Down! The forex industry seemed unable to sustain its momentum after a strong start in January and a bit of levelling off last month. Brokers and global exchanges reported significant declines in trading volumes, although these can be attributed to seasonal factors again as traders probably took long vacations around the Easter holidays. International derivatives marketplace CME Group reported a 4.4% month-over-month slump in forex average daily volumes (ADV), sharper than February’s 1.7% decline. This translates to a 16% drop from March 2015’s ADV levels. In contrast, equity indices and commodities trading posted double-digit monthly gains. Interactive Brokers, which is one of the major online trading services providers in the U.S., reported a drop in its daily average revenue trades (DARTs) to 658,000. That’s 14% lower compared to the previous month but 3% higher compared to the same month a year ago. Institutional electronic forex trading platform FastMatch painted a similar picture, as its ADV for March 2016 was down 9% from February 2016 and 23.2% higher compared to March 2015. The Moscow Exchange, which is Russia’s biggest trading venue for forex, shares and derivatives, actually reported a 1% gain in its monthly FX market turnover. However, average daily volumes were still down 3.5% in March from the previous month. In Japan, the Tokyo Financial Exchange reported a whopping 23.1% tumble in Click365 total FX volumes. On a more positive note, the number of contracts for March was up 15.2% from the same month in 2015. Looking at the breakdown of currency pairs shows that trading among yen pairs slowed while volumes picked up for GBP/USD and EUR/USD. On a year-over-year basis, GBP/JPY trading is up by 112.9% while GBP/USD volumes surged by a jaw-dropping 782.1%, possibly as Brexit fears resurfaced and BOE officials shifted to a much more downbeat bias. CAD/JPY recorded the largest monthly drop in volumes for March, most likely due to the increased uncertainty in the crude oil arena then. Moving forward, it looks like these Brexit and oil themes could continue to impact price action and trading volumes this month, especially since OPEC nations are scheduled to have a meeting on April 17. Other factors that could continue to affect forex trends and industry metrics in the coming months include Fed rate hike hopes and Greece’s looming debt repayment in July.